We grew up on the island of Lefkada, not only with our families from the remote villages of Englouvi and Syvros, but also with our Mother's cherished girlfriends. Yes, mom was surrounded by many dear friends that displayed a unique Christian love and adoration towards her children. They would often congregate at our house to engage in endless discussions about everything and I, envious of their snickering and secret conversations, would dream of the day that I, too, would have beautiful, smiling and loving girlfriends like Mom's. Her best friend, until the end, was Koulitsa. She was our Koulitsa, the Koulitsa of all the children of the family. The Koulitsa of love and altruism, the Koulitsa of giving and Christian generosity, the Koulitsa who learned from the Gospel to "love one another." Koulitsa, whose real name was Vassiliki Karydi, was also my own personal favorite. She had a beautiful face with very expressive green eyes and bright red cheeks that reminded you of some Hollywood star, a sort of cross between Vivien Leigh and Lauren Bacall. She would call me "tomboy," because, of all the children, I was the most aggressive, unforgiving and uncompromising. She adored me immensely, often covering up my misdeeds and intervening on my behalf so that Mom would show leniency. She lived nearby, in the square of the Cathedral of Lefkada, along with her mother, the late Amalia Karydis. They shared a humble home together, solemnly, devastated by the grief of her Father's murder at the hands of rebels during Greece's Civil War (1945-1949) which they were never able to overcome. Their humble place was decorated with photos of her sister, Lenio, another beauty, and her other sister, Maria, who was an absolute doll and had moved to America with her husband, Menelaus, and their two children, Philip and Spiro. Through Koulitsa, we became so close with her two nephews that we call each other, to this very day, "cousins." When they would visit us for the summer, we never differentiated Philip and Spiro from our own blood cousins as they had become such an integral part of our lives. Our Moms were "soul sisters" and we were overjoyed that our family reached all the way to the lands of the "Great Americas." 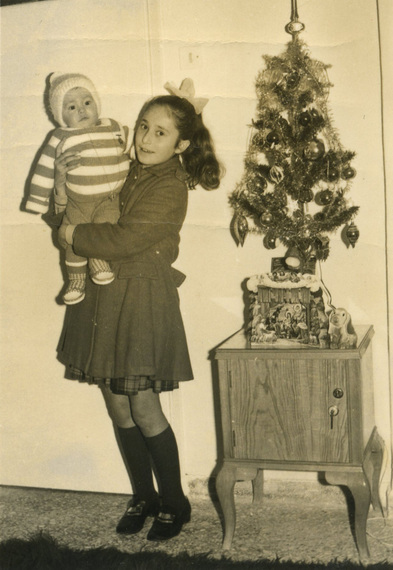 Koulitsa taught me the meaning of Christmas from my early childhood. At the time, poverty was rife on the island and the church would make bundles of clothing, toys and food to distribute during the holy days. And Koulitsa, faithful and devoted to her religion and its message of solidarity, would be hard at work, from the outset of November, preparing the parcels for the needy families along with the other caring ladies of our parish. As Christmas neared, with a cold, damp tingle descending on Lefkada, Koulitsa would take me by the hand to visit the city's neighborhoods and dole out the packages. She would give me one per home which I would proceed to approach, knock on the door and wish all a "Merry Christmas." The people would welcome me warmly, caressing my hair and expressing their gratitude. All the while, Koulitsa who would wait discretely, hidden in the distance. It is in this memorable role of assistant, as Koulitsa's "little elf," that I would pass the days leading up to Christmas. And every time I would complain that my soles ached from all the walking, Koulitsa would insist that I should be happy as God would shower me in his gifts. When Christmas arrived and Santa did not bring something "extra," I would murmur that "once again, God did not send my gift." But I never dared openly complain to Koulitsa as I did not want to disappoint her, hoping she would take me along to distribute the packages the following year. Koulitsa also taught me to offer some of the Christmas gifts that I received to the poor. I would proudly show her my toys and she would advise me to enjoy them for a few days and then to offer them to the other children in the neighborhood whose parents did not have the means to buy them presents. Obediently, I would carefully wrap my dolls in their boxes and give them to other girls well before I had finished playing with them in the hope that I would receive God's gifts in return. It was not until much later, that I realized what these multiple gifts of God, of which Koulitsa spoke, were. For Koulitsa, the most important day of the year was New Year's, or St. Basil's, her nameday, where she would smartly decorate her home and open it up to her umpteen visitors. Dozens would arrive from all over the island, including all of my family, to honor her for her contributions towards the poor along with her efforts to provide free medical injections to many needy Lefkadians. Koulitsa would always have me by her side, as her assistant when serving her visitors, and that was the greatest honor a child could have. Koulitsa suffered, since her youth, from a heavy dose of rheumatoid arthritis that gave her great pain in her spine and knees. Regardless, she was never absent from church on Sundays. Today, immobile as she is, she continues to insist on attending the weekly liturgy, deeming it a sin to be absent. Koulitsa taught me love, solidarity, and God's offering to Man, as transcribed by Paul, the Apostle, in the "Hymn of Love." I love her and always think of her at Christmastime in this far off land especially now that I have learned, one by one, the nature of the gifts that God sends in return for those innocent days in Lefkada.